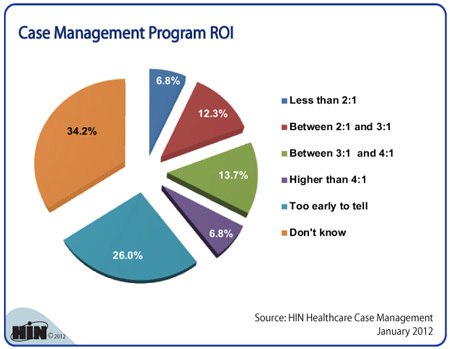 Healthcare Intelligence Network- Chart of the Week: What's the ROI from Case Management Programs? New Chart: What's the ROI from Case Management Programs? SUMMARY: Post-reform redesign of clinical care delivery and reimbursement underscore the healthcare case manager's dual roles as care coordinator and utilization manager. Case manager work locations, job focus and caseloads are evolving in response to these shifts in the healthcare landscape. We wanted to see what ROI has been generated by case management programs. Download the executive summary of 2012 Healthcare Benchmarks: Healthcare Case Management. 2012 Healthcare Benchmarks: Healthcare Case Management provides actionable information from 153 healthcare organizations on the prominence, placement and responsibilities of case managers as well as case management-driven results in healthcare utilization, cost and compliance. 2012 Healthcare Benchmarks: Healthcare Case Management is available from the Healthcare Intelligence Network for $149 by visiting our Online Bookstore or by calling toll-free (888) 446-3530.